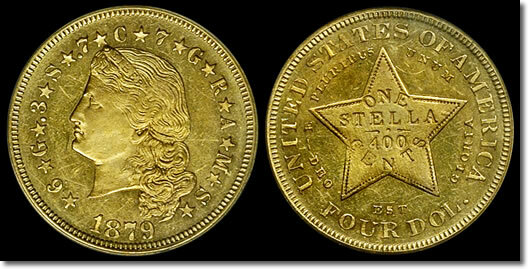 Teletrade, America’s premier Internet auctioneer of certified coins and currency, is excited to announce its 2-Day Post ANA Sale, August 26 and 27, 2012. 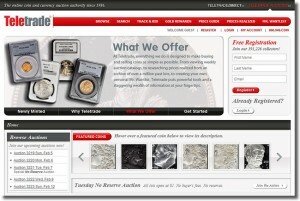 Teletrade, America’s premier Internet auctioneer of certified coins and currency, is proud to announce the new Teletrade.com, launched February 2, 2012. The new website features a fresh look, easy navigation, and increased focus on our collectors’ and consignors’ needs. Teletrade, the largest Internet auction company for certified coins and currency, wrapped up the Santa Clara Coin, Stamp and Collectibles Expo with the successful sale of 2,700 lots that realized $1,072,219. Coin Auction Total for June Goes Over $4.75 Million! Teletrade Special Friday Auction on June 27 Tops $1 Million, With Five Coins Exceeding $100,000 Each. 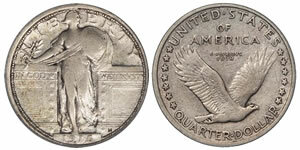 IRVINE, Calif. – Teletrade, America’s largest fully automated Internet auction company for certified coins and currency, hosted a very special Friday online auction on June 27, 2008, in addition to their three regular weekly auctions. Teletrade Auction 2549, consisting of just more than 200 exclusive certified coin lots, realized an outstanding $1,050,000, bringing Teletrade’s June auction total to more than $4.75 million, a record high month for Teletrade prices realized! This special Friday auction featured an amazing selection of certified coins highlighted by another original hoard of PCGS Green Holders, including many Wells Fargo $20 pieces, auctioned alongside a variety of other extraordinary U.S. rarities certified by PCGS and NGC. IRVINE, Calif. – Teletrade, America’s largest fully automated Internet auction company for certified coins and currency, will host a very special Friday online auction on June 27, 2008, in addition to their regularly scheduled three weekly auctions on Sunday, Monday and Wednesday. This is Teletrade Auction 2549 consisting of more than 200 exclusive certified coin lots, and will be live at www.teletrade.com from 3 p.m. to 10 p.m. eastern time. Bidding is open now and the complete catalog is viewable on the Teletrade website. 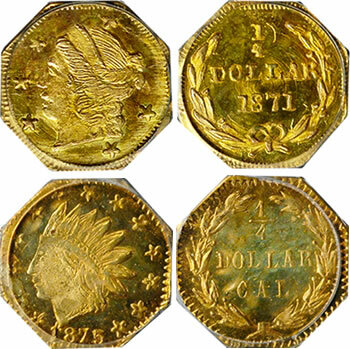 IRVINE, Calif. – Teletrade, America’s largest fully automated Internet auction company for certified coins and currency, will auction “The Kovach Collection of Period One & Two California Fractional Gold” on Sunday, June 22, 2008, in online Auction 2546. The auction will be live at www.teletrade.com from 3 p.m. to 10 p.m. eastern time and will include more than 1,500 certified coin lots. The complete auction catalog will be viewable on the Teletrade website beginning Friday, June 13. 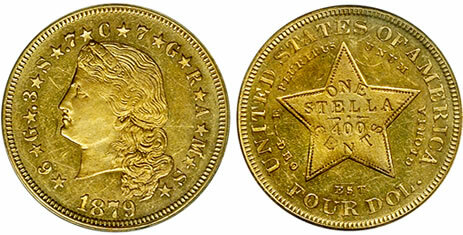 California Fractional Gold has a storied history complete with touches of controversy that only adds to the mystique. The tiny small denomination gold pieces were privately issued during the California Gold Rush economy, hand-struck mostly by entrepreneurial San Francisco jewelers, as a result of the Federal government’s unwillingness to issue sufficient small denomination coinage. “The Kovach Collection” is listed as the “3rd Finest Set of All Time” on the PCGS Set Registry, retired in June 2007, and Teletrade will auction more than 75 coins from the set in individual lots. The collection represents Period One, struck 1852-1856, and Period Two, struck 1859-1882. 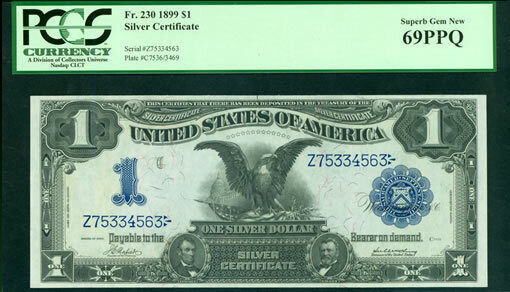 IRVINE, Calif. – Teletrade, America’s largest fully automated Internet auction company for certified coins and currency, announces the record-setting sale of an 1899 “Black Eagle” Silver Certificate. Bidding on the note advanced to $30,000 during Teletrade’s December 10 auction, but the note did not meet the reserve. A day after the sale, Teletrade sold the note to a private buyer who was previously unavailable during auction bidding.